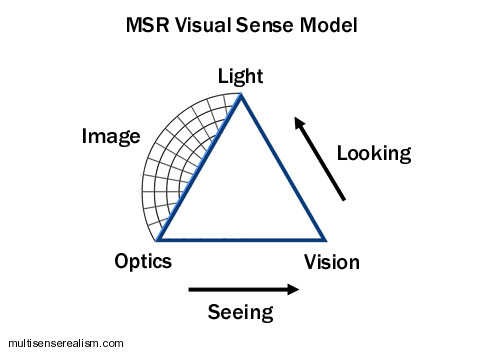 In the above diagram, the nature of light is examined from a semiotic perspective. As with Piercian sign trichotomies, and semiotics in general the theme of interpretation is deconstructed as it pertains to meanings, interpreters, and objects. In this case the object or sign is “Optics”. This would be the classical, macroscopic appearance of light as beams or rays which can be focused and projected, Color wheels and primary colors are among the tools we use to orient our own human experience of vision with the universal nature of material illumination. On the other side of bottom of the triangle is “Vision”. This is the component which gives vision a visual quality. The arrows leading to and from vision denote the incoming receptivity from optics and the outgoing engagement toward “Light”. When we see, our awareness is informed from the bottom up and the top down. Seeing rides on top of the low level interactions of our cells, while looking is our way of projecting our will as attention to the visual field. 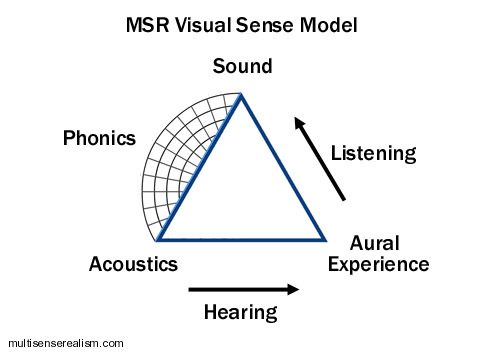 While optics dictate measurable relationships among physical properties of light on the macroscopic scale, ‘light’ is the hypothetical third partner in the sensory triad. Light is both the microphysical functions of quantum electrodynamics and the absolute frame of perceptual relativity from which various perceptual inertial frames emerge. The span between light and optics is marked by the polar graph and label “Image” to describe the role of resemblance and relativity. Image is a fusion of the cosmological truth of all that can be seen and illuminated (light), with the localization to a particular inertial frame (optics-in-space), and recapitulation by a particular interpreter – who is a time-feeler of private experience. 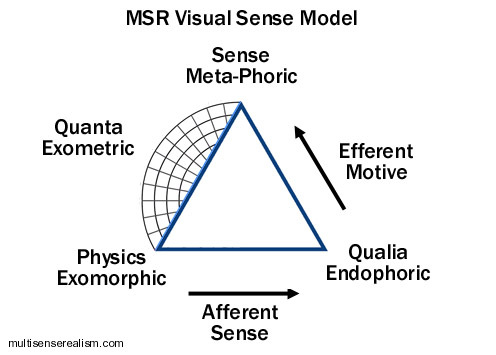 Note that the afferent and efferent sided of the triangle have a push-pull orientation, while the quanta side is an expanding graph. This is due to the difference between participation within spacetime, which is proprietary feeling, and the measured positions between participants on multiple scales or frames of participation. Sense is the totality of experience from which subjective extractions are derived. The physical mode describes the relation between each subjective experience and between other frames of subjective experience as representational tokens: bodies or forms. It’s all a kind of trail of breadcrumbs which lead back to the source, which is originality itself.